What are some of your previous working experiences? I had a paper route with my mom at age 5, sold candy and gum in junior high school (and got in trouble for it) and in my teens ran a lawn-mowing and snow shoveling business as well as some construction work on the side. I was a lifeguard and pool operator certified in CPR in the summers of high school. In college I waited tables and worked at the gym where I got certified as a personal trainer. After graduating from Uni I went into banking and ended up in the private wealth management arm of BOA Merrill Lynch. After completing my MBA in Hong Kong I built my first startup, a B2B travel business. What inspired you to start The Asia Accelerator? I have a fear that as a species we are far behind where we could be. I worry that there are many people out there with great ideas but they don’t know how to turn them into a viable solution or business. I worry that others do get to take that step but then fail because they don’t get access to capital, mentorship and other resources they need to succeed. I hope The Asia Accelerator can make a small dent in this problem and help make our species and many others healthier and happier, our planet likewise and yes even space and the multiverse. By empowering founders solving big problems I believe we can make a difference, and potentially a big one. 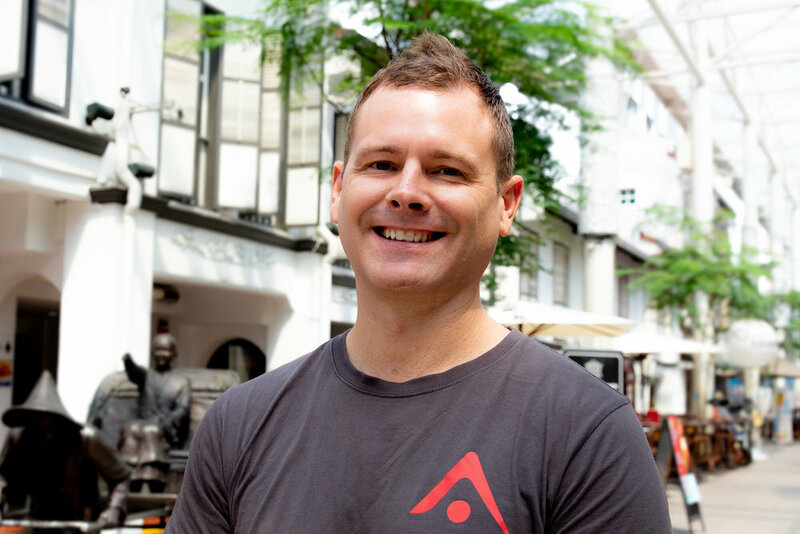 What is your day-to-day like at The Asia Accelerator? There is no day-to-day lol. One day I’m off to Jakarta, Dhaka or Manila meeting founders and promoting the program, the next I’m back in Singapore hosting our weekly open house series. On other days I’m writing blogs or interviewing potential candidates to join our growing team. Many days I’m sitting down with the founders in our program, helping them solve their challenges, introduce them to valuable mentors or investors, and generally helping them move faster while de-risking their business. Then we’re off to Silicon Valley followed by Demo Day. It’s great because I really need variety in my job; I have a short attention span… What was the question again? What is your favorite startup advice? You need to become an expert in conveying your company’s vision and inspiring others to join you as employees, investors, mentors or customers. So founders, practice storytelling now. I wish I had known this earlier in my startup journey. I read voraciously, run, lift weights, play tennis, swim and drink red wine and beer (not mixed together). What songs do you like to listen to? I’m an introvert but can channel extroversion in short bursts (but it drains me). What is on your bucket list for 2019? Lots of hiking, boating, etc. followed by great food and drink, all with good friends and surely some reading before bed. What is one thing that is unexpected of you?